In 1912, the Swift County Hospital was constructed at a cost of $15,000 and had a capacity of 25 patients. In 1949, a new City-County Hospital was constructed for $400,000. In 1971, a Million Dollar addition was added to the hospital. Swift County-Benson Hospital celebrated its 90th anniversary in 2002. The addition of a new emergency facility was completed in 2003. The new Surgical Center was opened in 2008. In 1912, Dr. Saxe J. Froshaug built the first 19 bed hospital for $5000. Both businessmen and farmers worked together to raise $1500 for equipment and guaranteed $100 a month for the first year of operating expense. Other public spirited groups donated equipment, food, sheets, pillows and pillowcases. 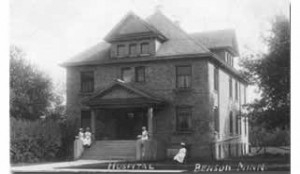 The new hospital opened on November 21, 1912. Thirty-seven years later, the 1912 hospital had become outdated and, in many areas, couldn’t be updated for the new technology. The community began discussing the need to build a new hospital. They wanted a larger hospital that offered all the current technology so the people who lived here could have the most modern health services available to them locally. In 1946, the City and the County Directors made the decision to move forward and build a new 40 bed hospital. Through bonds and government help $300,000 was raised. The $300,000 would cover the building, but another $50,000 was needed for equipment and furnishings. Federal aid for the furnishings was available based on the amount of money on hand. For each dollar donated by the community to the hospital, another 45 cents was added by the federal government. On Monday, October 23, 1949, Governor Luther W. Youngdahl laid the cornerstone and addressed a crowd of a few hundred persons. The next Saturday, October 29, a crowd of nearly 3,500 persons toured the new building during an open house that began in the early afternoon and lasted until after 9 p.m. On Tuesday, November 1, 1949 the first patients were moved from the old hospital into the beautiful new facility. In August 1971, plans for upgrading the 22 year old hospital became a reality when SCBH was approved for a federal grant of $245,500 from the Hill-Burton Foundation. 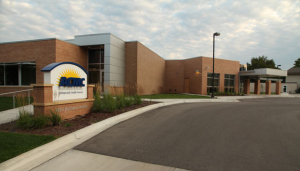 This grant covered nearly 25 percent of the estimated cost upgrades and new construction. In 1973, a one million dollar addition to the hospital added a new lab, x-ray, emergency department, obstetrical rooms, operating and recovery rooms, plus a kitchen, supply rooms and air conditioner and generator. Costs for this addition were covered by the city and county, with the remainder raised through revenue bonds. Once again, in 2003, the community came to the forefront in support of the hospital. Through a capital fundraising campaign organized through the SCBH Foundation, community members donated over $980,000 toward the $2.3 M project. $1.5 M of the project financing was accomplished with low interest financing through the USDA. The project included a new emergency services department, new areas for physical and occupational therapy, cardiac rehabilitation, a CT Scanner, new outpatient services waiting and reception area, a new x-ray machine, chapel and birthing area. Built in 2007, the new $6.1 million Surgery Center stands as a beautiful tribute to the generosity of the community, and the work of the SCBH Foundation and Auxiliary who collectively raised over $650,000 for the equipment in the Surgery Center. Appreciation also goes to the Swift County Commission who arranged for low interest financing through the provision of general obligation backing of the hospital revenue bonds used to finance the project. 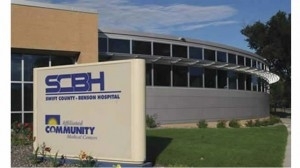 In June of 2012, the hospital broke ground on a $5.3 million clinic and hospital addition/renovation. The Swift County Commission offered to provide $2.0 million in funding at an interest rate that was lower than the hospital could secure through the lending agencies. The project was completed in the fall of 2013.